On his 2006 debut release “Forgotten Melody”, Melbourne bass great Wayne Jones proved to all he’s one of the rare few who can deliver an album full of beautifully constructed musical storylines featuring the bass as the central character. Proving he’s no one trick pony, Jones has done it again. 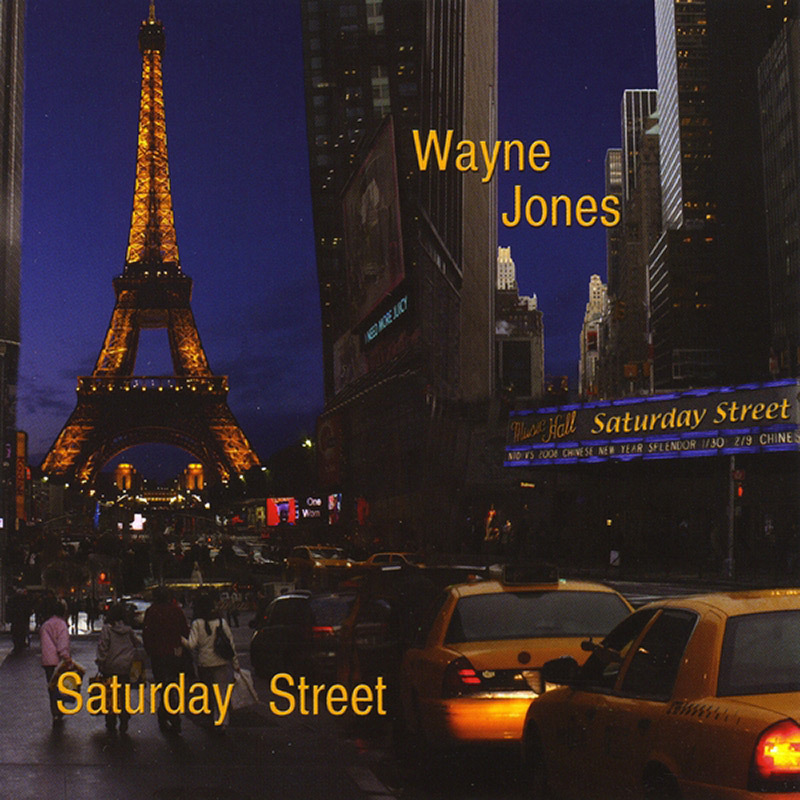 Merely three years after his first solo effort, Wayne Jones offers us “Saturday Street”, another rich slice of sophisticated jazz flavoured pie. The key to any successful musical endeavour in this genre is the quality and allure of the instrumental conversations between musicians. On “Saturday Street” Wayne’s collection of virtuosic buddies talk it up big time. There’s no doubt the accompanists shine, but in the end it’s Jones’ street party. His command of the bass and those nimble yet fluent licks will remain embedded in your mind long after the disc has come to a close. In a world turning upside down, where it’s easy to get caught up in the rapid pace of life and all its negativity and complexities, it’s comforting to know that at the end of the day it’s really all about how you choose to perceive things. You can simply shut your door, kick off your shoes, and immerse yourself in life’s more pleasurable pursuits. Better still, I heartily recommend a gentle stroll down Wayne Jones “Saturday Street” in the company of someone you love. Opening proceedings with “Strictly Dan”, Jones wears his musical heart on his sleeve, as he pays tribute to American music icons Steely Dan. Fat bass slaps feature as the band in full flight forge ahead with purpose and precision. The title track, “Saturday Street” finds Jones with a spring in his step, as he and his ensemble strut down his funkified thoroughfare. The “Back in Five” vibe is one of a world we sometimes forget, a stop and smell the roses kind of feel, where things really don’t seem so bad after all. Track four is the self-descriptive “Slow and Mellow”, a dangerously seductive device for those quiet moments with a special friend. “Sneaky Pete” finds the band neatly in the pocket right out of the blocks. Not only are Jones’ chops remarkable, but his compositional ideas and improvisational skills are impressive too. “MK3” provides a leisurely walk down a sumptuously textured path. A scintillating sax solo adds a scent of spice to the air. showing off. The bass ideas are eternally tasteful and executed with style. Any attempts to resist the samba flair of “Latin Tyme” are futile. From the opening few moments of “Hiraeth” you realise there’s some major musicianship goin’ down. Utilising the bass in a variety of guises, Jones takes total control of this substantial sonic brew. Much like a well-deserved nightcap, “I’m In The Mood” is an appropriate end to a perfect day. Cheryl Beattie adds a smooth as silk vocal over a heart-melting melody. The bass phenom is back with his Saturday Street sophomore release, and from that effort, we have a great ska-flavoured tune in the rocksteady Back In Five!! Wayne Jones had started in music as a drummer but a mishap in his teens left him with only partial use of his left thumb and so he took up the bass instead. Based in Melbourne, Australia, Jones has operated in a variety of musical settings over the last three decades. With a characteristic frankness, he articulates, “You have to play many styles of music here to survive.” From cover bands and sessions to film and TV, the wonder from down under had just about ‘done it all’ – except for issuing an album under his own name. Although it was 7 long years in the making, that dream was fulfilled with the 2006 issue of Forgotten Melody, which in spite of a title that might suggest something to the contrary, was indeed a highly memorable debut and one of the more pleasant surprises for the year!! Now the bass phenom is back with his Saturday Street sophomore release, and from that effort, we have a great ska-flavoured tune in the rocksteady Back In Five!! Wayne Jones had started in music as a drummer but a mishap in his teens left him with only partial use of his left thumb and so he took up the bass instead. Based in Melbourne, Australia, Jones has operated in a variety of musical settings over the last three decades. With a characteristic frankness, he articulates, “You have to play many styles of music here to survive.” From cover bands and sessions to film and TV, the wonder from down under had just about ‘done it all’ – except for issuing an album under his own name. Although it was 7 long years in the making, that dream was fulfilled with the 2006 issue of Forgotten Melody, which in spite of a title that might suggest something to the contrary, was indeed a highly memorable debut and one of the more pleasant surprises for the year! Now the bass phenom is back with his Saturday Street sophomore release, and from that effort, we have a great ska-flavoured tune in the rocksteady Back In Five!